This photograph was submitted by Jim Murphy who is originally from Fassaugh Road. Jim now resides in the great U.S. of A. The photo shows a young football team from Saint Anthony’s Boys Club who at the time may have been based in Eccles Street. The photo was taken over sixty years ago. 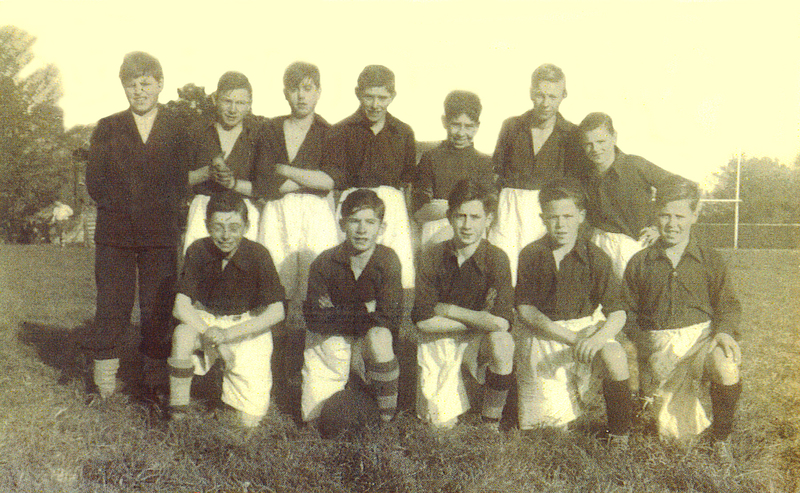 The names of the young footballers are, front row: John Cummins, his brother Tony Cummins (their mother was a dealer in Moore Street. They lived on Jarleth Road), Sean Doherty from Fassaugh Road…facing the Playground, Jemmers Mc Kendrick and Philip Brady (from Fassaugh Road, beside the Fassaugh Stores). The front row is: Unsure, Jim Murphy, Goalkeeper Buggy, Anthony Scanlon lived two doors away from the Murphy’s on Fassaugh Road. His mother was also a dealer in Moore Street, Tierney and Morrissey. Jim tells me that some of these lads came from Attracta Road. Perhaps there are others who may also know some of these lads.